OK…..so several of the last posts were about playing with fabric. I can admit it now that I was really wiped out after the fabulous Quilters Hall of Fame Celebration last summer. I didn’t pick up a needle and thread to Applique until February! In February I needed to get ready for the Academy Of Applique in Williamsburg. My teaching project was a fun little quilt with four blocks, each having the same shapes…great for beginners! I was ready, the class was at the beginning of March, I had a fabulous time, and when I got home, I was a changed woman! The needle felt good in my hand again, the thread was smooth and beautiful, and my silver thimble was ready to stitch! So here’s what I have been doing this March……. I finished stitching the four blocks from The Academy! The borders are done too, but I’m saving them for a border class before I stitch them on! I finished three blocks from my year-long class that I used as samples for back-basting! Whoo-hoo! There’s one more block almost done, but I just don’t think it will be finished by the end of March (tomorrow!) and I really really wanted to write a post this month! So…..it works! It really does! If you just can’t get into a project, pick up something else and PLAY! And then when you are ready, pick up your project each day and work on it for five minutes! Surely that five minutes will turn into more, but it’s that starting point that gets you going! You just never know what you can accomplish! We all appreciate companies that give back! March is National Craft Month. 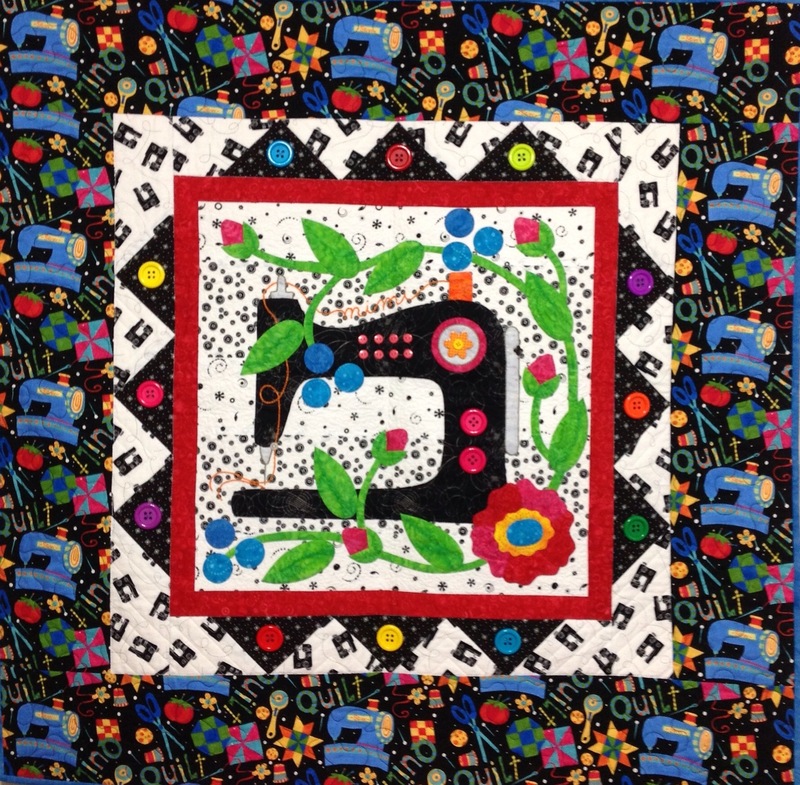 Wouldn’t it be amazing to be able to donate $1000 to your favorite craft charity…..like The Linus Project, or your guild, or my personal favorite…..The Quilters Hall of Fame! 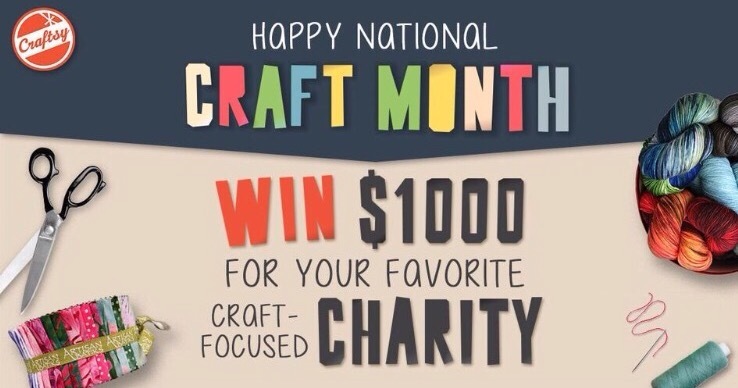 Craftsy is giving one of their students a chance to choose the charity for their donation! One student who signs up for a class before March 13 will win! What a fabulous prize! 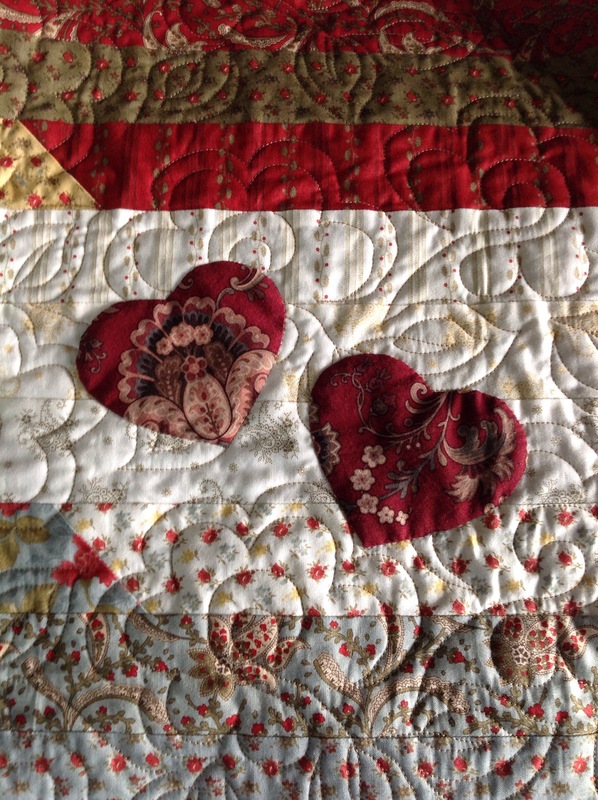 This link will take you to one of my favorite Craftsy quilting classes. Click on it, then check out the Craftsy classes….there’s also cooking and baking, knitting and crocheting, and great sewing and quilting classes. This is a special link to sale prices for Craft Month. It will also give you a chance to help Craftsy give back! 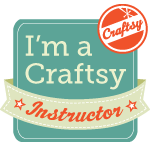 If you have never bought a Craftsy class…..this is the time! Here is one more quilt in my “Play” series! This sweet sewing machine is from a pattern by my friend Pat Sloan. It’s called Let’s Go Sew. 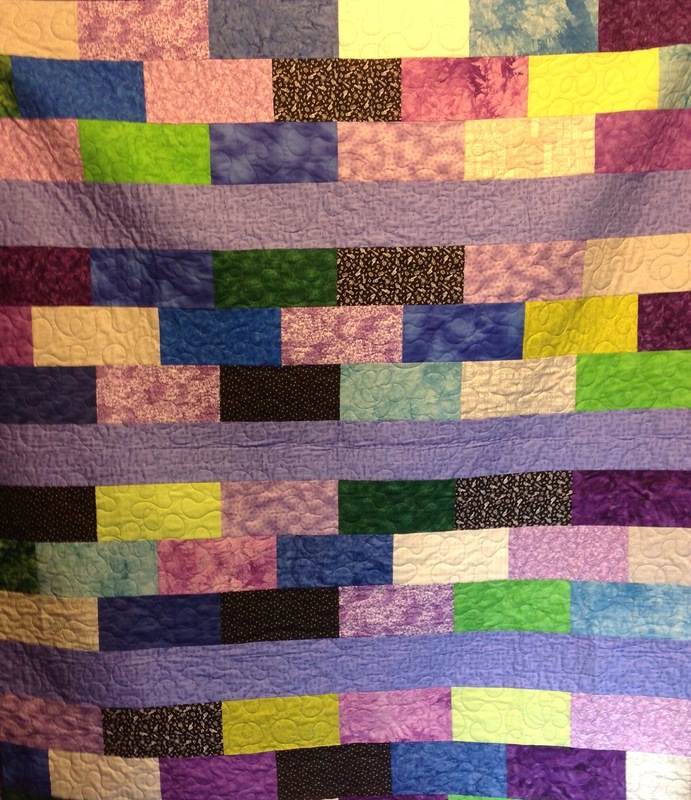 The pieces are big and easy to stitch…and the quilt was SEW much fun to make! I was in a spot where I just didn’t feel like stitching small Appliqué pieces or anything intricate at all. But this colorful design got me back in the groove! It was great to applique, work with sewing-themed fabrics, but even better to add button embellishments and a touch of embroidery. Can you see my name in the thread? Now I’m ready to applique again! Last summer I took Julia to the quilt shop with me and she had a great time shopping! 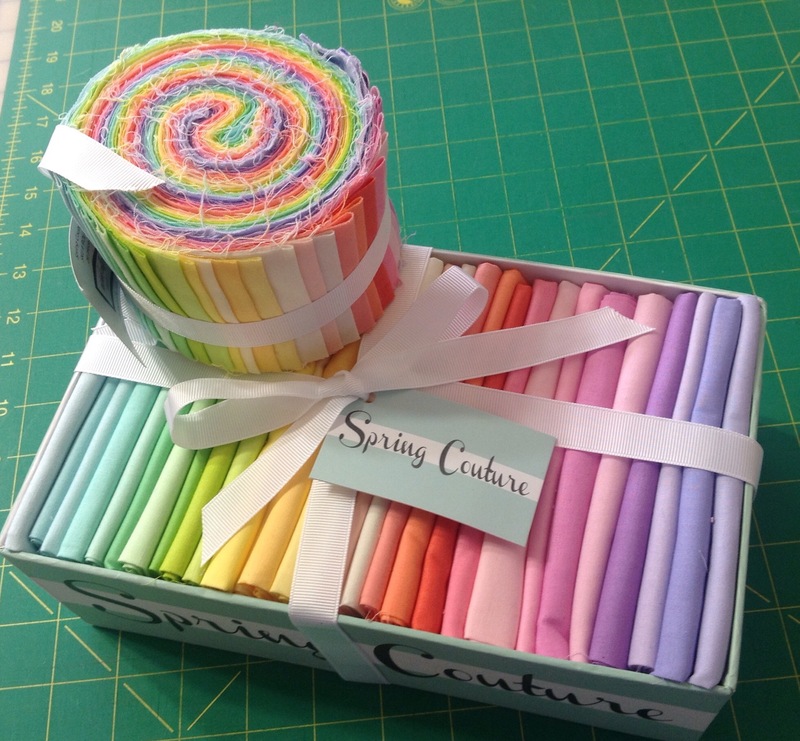 She found a Layer Cake (40 ten inch squares in a package) that she loved…and a pattern to go with it! We came home, cut the layer cakes into rectangles 5″ x 10″ and started to make the quilt. Julia arranged the colors, sewed the rectangles together, and we had some sewing fun! Again, this was so “not me” but anytime I sew with Julia is a treat. This was not about what I wanted to do, it was about being with my favorite granddaughter, playing with the colors and fabrics and creating a quilt together. 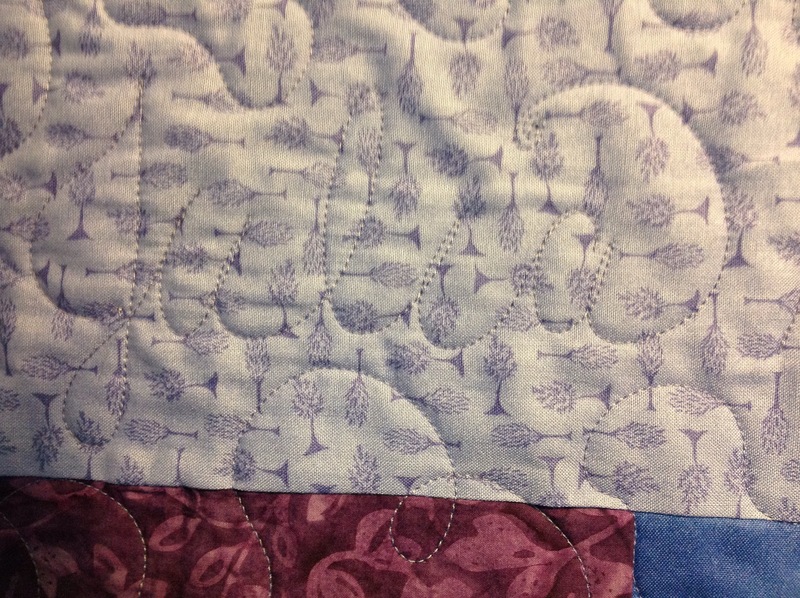 It was quilted with swirly loops and flowers, but there are words quilted in the plain purple strips…..Julia Dietrich made this quilt with Grammy Summer 2015. It’s fun to look for the quilted words, and it was a different way of signing our quilt! Whew! It was fun and exciting to go to the Craftsy Instructors Summit and I came home with some challenging things to do! But let’s go back three posts to the one titled New Year! I have some photos I want to share about playing with fabric, and in the process getting back to appliqueing. One Saturday last fall I got together with my Monday Night Madness quilting friends and we just sewed and sewed and sewed. We made Jelly Roll Race quilts. 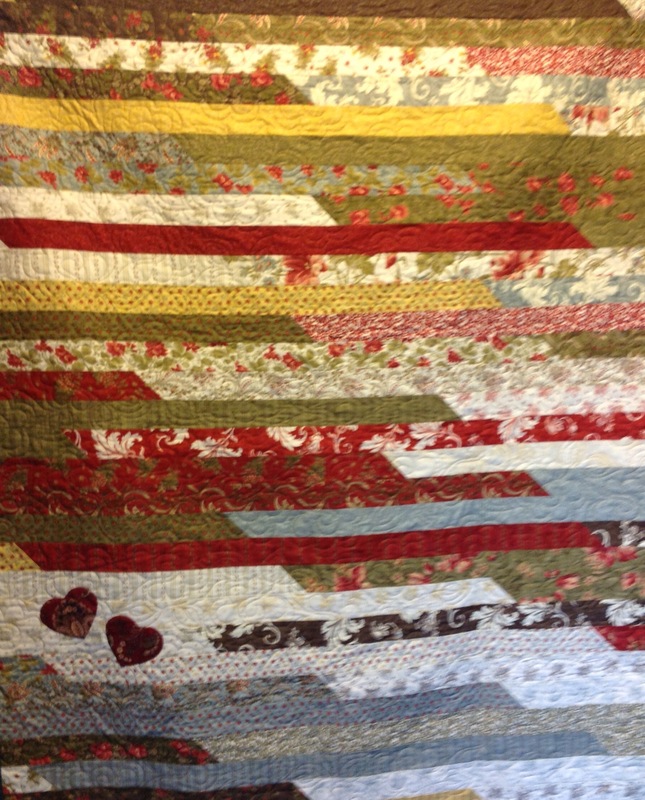 This involved sewing forty strips of fabric into one long strip, then sewing the strips together into a quilt. Google Jelly Roll Race for more info! It was SEW much fun! It was definitely playing with fabric! That white spot at the bottom bothered me, so I appliquéd two hearts there. My favorite moment was when I showed it to Bob and he said, “Well, it’s not your best work!” No….but it was great fun sewing with friends and just having fun playing with fabric….and feeling like I was making something fun! I really loved the quilt after Daria quilted it. It became a fun present for a special friend….and she loved it too! The final event of the Craftsy weekend was a Town Hall. We came back from lunch and the room was set with chairs in the round. We could ask questions to the Craftsy founders. It was fun, casual, and very informative. Then we had door prizes! Lots of fun things that we learned about during the weekend….and lots of fabric and goodies that we love. So there I was, sitting at this Town Hall event, feeling like it was the Oprah show….and my number was picked first! I was so excited! I jumped up and cheered! I won the prettiest fabric! It’s gorgeous….and it feels even better! Thank you, Michael Miller Fabrics! Your Spring Coutour collection is perfect for snowy Baltimore! What am I going to make? I don’t know. But I am going to love just looking at the colors right now! All quilters love tote bags with goodies…. Craftsy really did a fabulous job with products from the sponsors for the weekend. We got Craftsy t shirts, Craftsy warm hats and scarves, notebooks, and the favorite was a portable phone charger…hooray! We got fabric packs, rulers, thread, and more! Enough that my suitcase was overweight on the way home! Here are two of my favorite things…the first, samples of my favorite thread! I met Alex, who is an icon in the Aurifil thread world (I should have taken a selfie!) 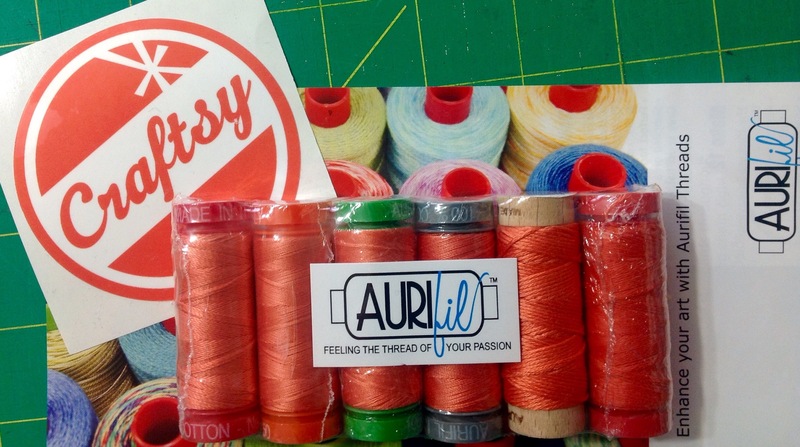 We got spools of all of the weights of Aurifil thread….in the perfect “Craftsy” orange! Great marketing! And then……the absolute cutest zipper I have ever seen from the Coats company. Love the scalloped edges! I’ve got to make some little zippered bags with these! Looks like a shopping trip to find more!